Kind and Kelly to map out a legislative strategy in early January 2019 to get this accomplished sometime this year. We will continue to meet with key members of Congress to press our issues. ACSA also had the opportunity to sit down with Senator Rob Portman (R-OH) who was a lead Republican member in the Senate on the FET reduction in the Senate Finance Committee. He is acutely aware that we need new legislation passed in 2019. Additionally, after our meeting, and as a direct result of his discussion with ACSA, he took to the Senate floor to also decry the negative effects of the government shutdown on label approvals and the setback to our industry. The challenge we face will be unique. Because the House and Senate are split along party lines, there is not a natural desire to hammer out a new tax bill, such as there was in 2017. We are going to have to think strategically about how we get this accomplished in 2019 with both parties looking differently at tax reform. Most important to this effort will be the grassroots of the craft distilling industry. 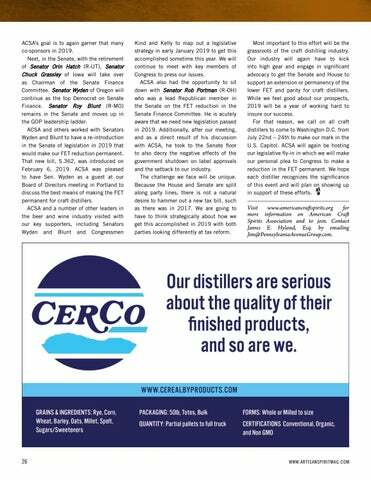 Our industry will again have to kick into high gear and engage in significant advocacy to get the Senate and House to support an extension or permanency of the lower FET and parity for craft distillers. While we feel good about our prospects, 2019 will be a year of working hard to insure our success. For that reason, we call on all craft distillers to come to Washington D.C. from July 22nd – 24th to make our mark in the U.S. Capitol. ACSA will again be hosting our legislative fly-in in which we will make our personal plea to Congress to make a reduction in the FET permanent. We hope each distiller recognizes the significance of this event and will plan on showing up in support of these efforts. 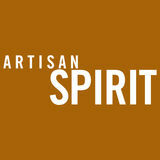 Visit www.americancraftspirits.org for more information on American Craft Spirits Association and to join. Contact James E. Hyland, Esq. by emailing Jim@PennsylvaniaAvenueGroup.com.